This series of social media posts first appeared in February 2016. “I was with you in weakness and in fear and much trembling” (1 Cor. 2:3). 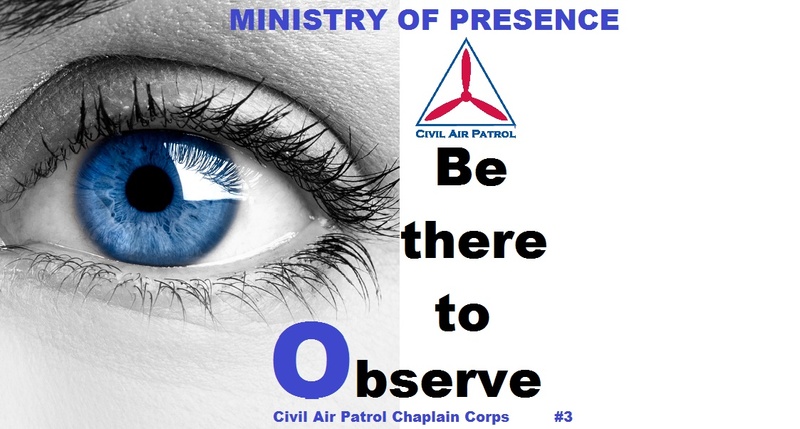 YOUR Civil Air Patrol Chaplain Corps will be there beside you in all our missions to support you and bring faith, hope and encouragement when things look dark. 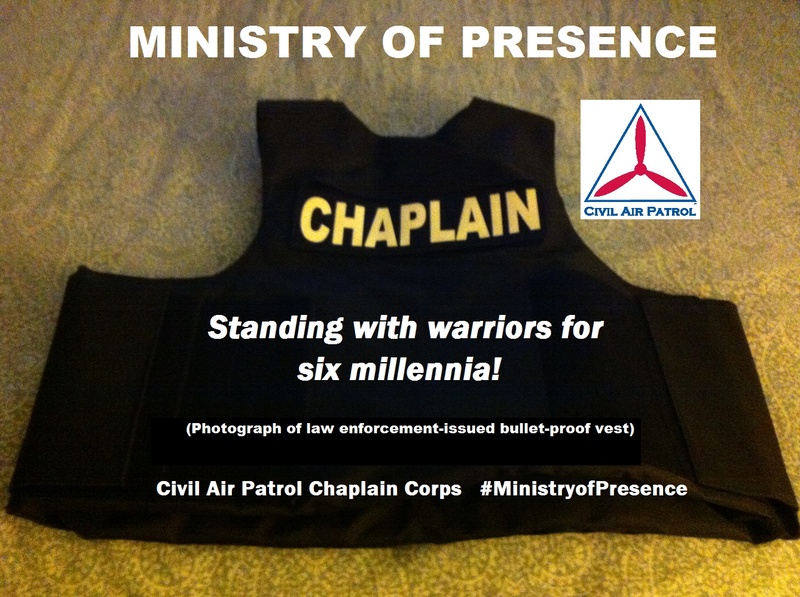 The Civil Air Patrol Chaplain Corps has a “ministry of presence.” What is that? “Chaplaincy ministry has often been called the ‘ministry of presence.’ Presence is both physical and emotional. First, the chaplain makes a conscious choice to be physically present with the client. Second, the chaplain is emotionally present with the client through empathetic listening. 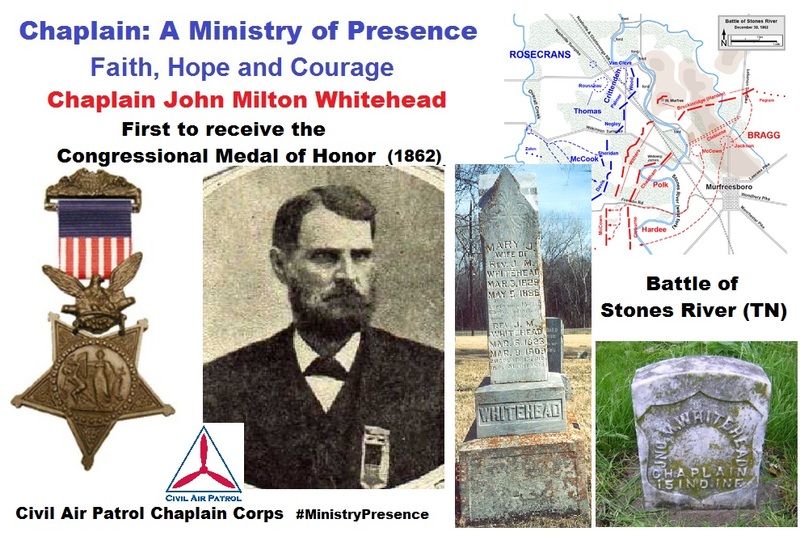 Through presence the chaplain begins to build the relationship that eventually brings comfort to those who feel alone in their suffering or despair. 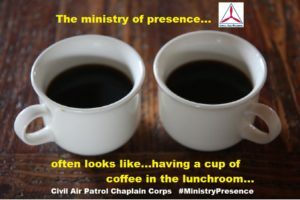 Some become frustrated with the ministry of presence. Goals don’t seem to get accomplished. Tasks don’t seem important. Doing seems secondary to being. Both the chaplain and the public may perceive that nothing is happening. But for the experienced spiritual care provider, the art of ‘hanging out’ with patients, clients, victims, or team members becomes an intentional event that leads to providing a calm presence during time of stress or chaos. …. 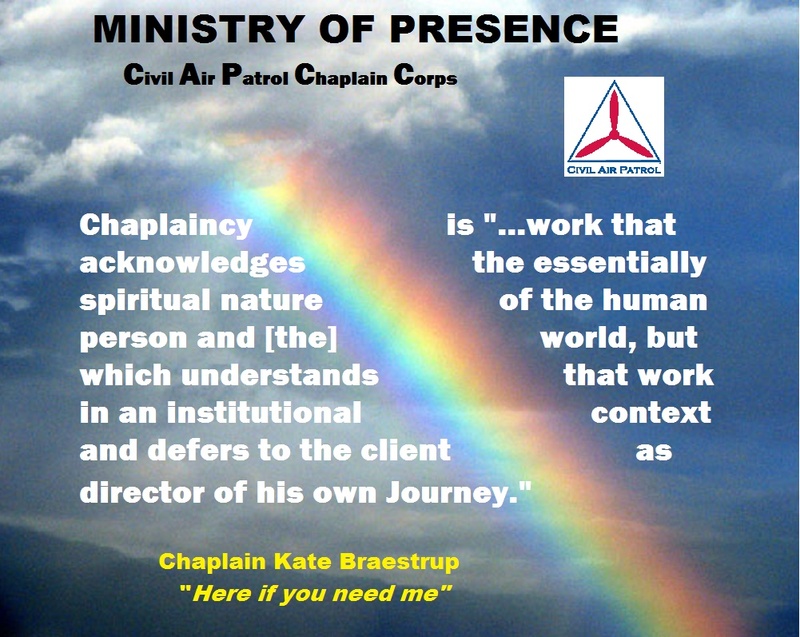 MINISTRY OF PRESENCE: The FIRST step of all chaplaincy is to LISTEN. This is an engaged and focused listening that hears what the person in need is really saying. 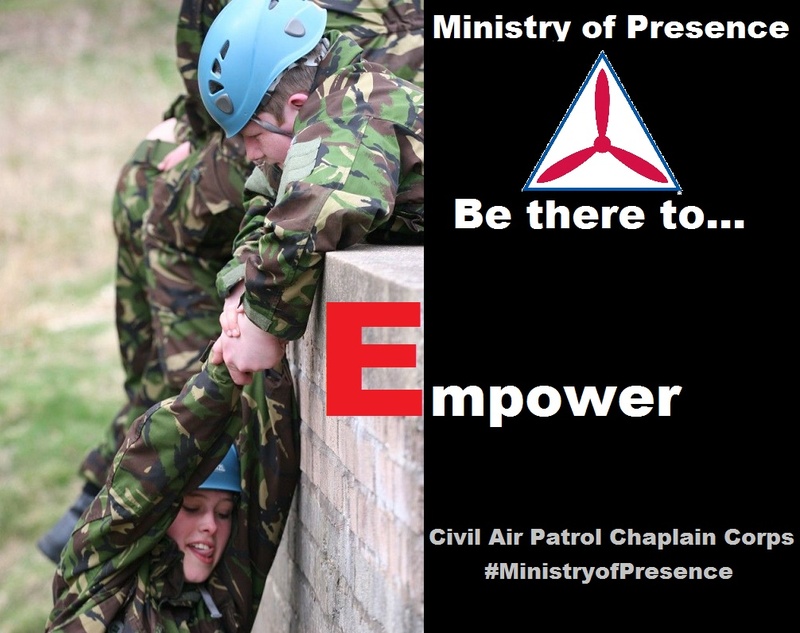 All chaplaincy starts from a position of letting the one in need do the talking. 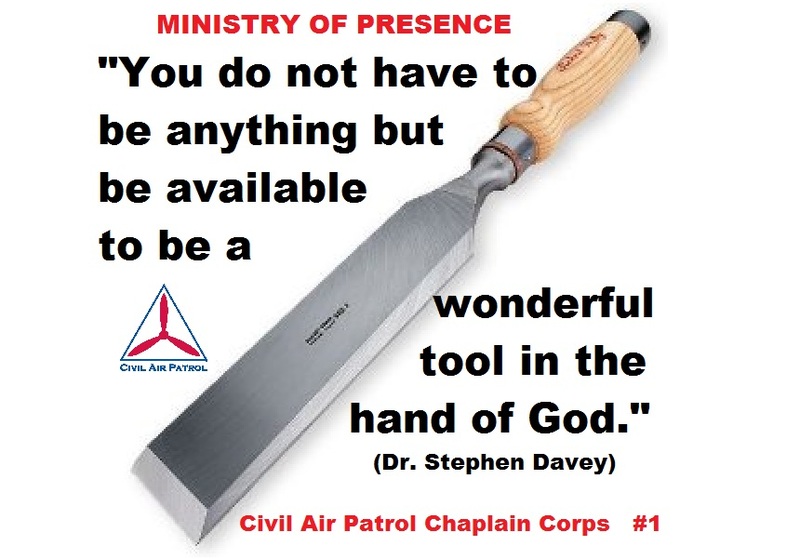 Only they truly know their needs and only they can articulate them to the person living the ministry of presence. 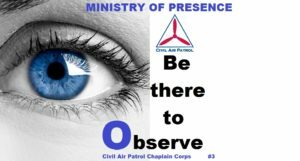 Your Civil Air Patrol Chaplain Corps members strive to live a ministry of presence in their units during all missions and in all activities. How can we serve YOU? YOU are why we serve. 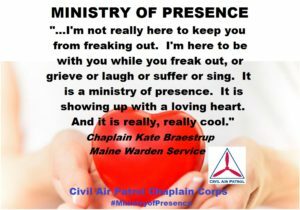 MINISTRY OF PRESENCE: While quietly living a ministry of presence by listening, chaplains should make sure that they OBSERVE the person in need. Not all communication is verbal and many times what you see in the eyes, gestures and expressions in another can speak more about their needs then they can articulate. 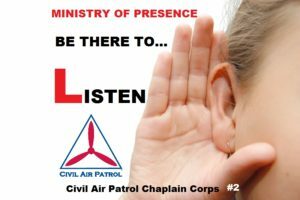 Your Civil Air Patrol Chaplain Corps members are there beside you during all our missions and activities to support you and let you do the “talking.” YOU are why we serve. 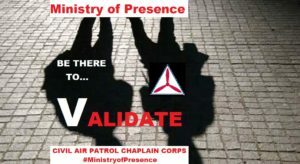 MINISTRY OF PRESENCE: As chaplains and soul-care providers listen and observe, there needs to be VALIDATION of what is being shared by the person in need. We do this when we REPEAT back what we think we have heard. We do this when we REASSURE the person in need that what they are experiencing and feeling is normal and difficult. We do this when we RETURN to listening and observing. We are YOUR Civil Air Patrol Chaplain Corps and we are here for YOU in our Ministry of Presence. 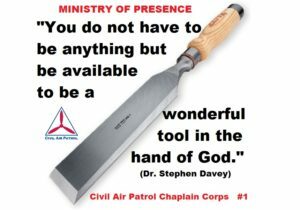 MINISTRY OF PRESENCE: To EMPOWER is to provide a HAND, provide HELP, and to provide HOPE to a person who is in need. Sometimes it only takes a little to give someone a sense of control back in their life, if even only in one area. This may be enough to set in motion a strengthening of their spiritual fitness and resolve. 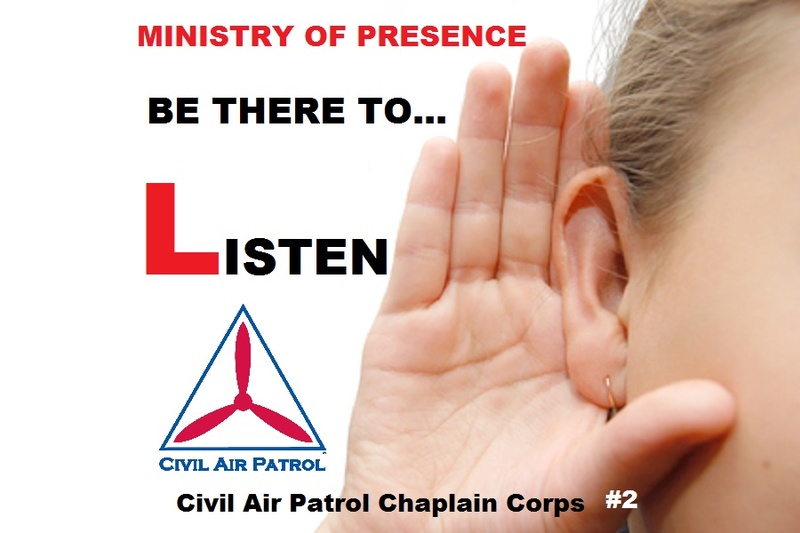 Our Civil Air Patrol chaplain corps is there for every member of the organization when they need us. We serve YOU. 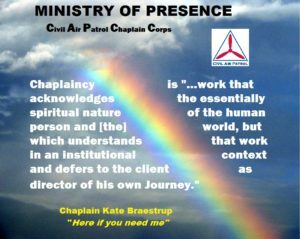 MINISTRY OF PRESENCE: Chaplains and other soul-care providers cannot have the answers to all of life’s issues. 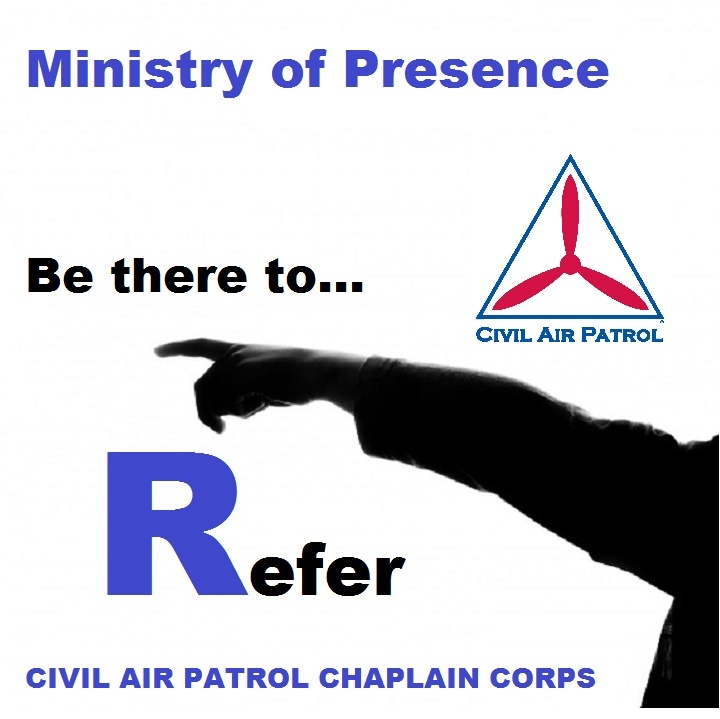 However, everyone involved in a ministry of presence should have a list of resources to assist a person in need. It is critical that a chaplain know their limits and where to get help if an issue requires professional mental, emotional, financial or medical support. This is especially important if the issue will take extra time or a specialist’s skills to solve. Chaplains in a ministry of presence need to REFER when necessary. Knowing where there are additional resources can make all the difference to someone who needs our care. 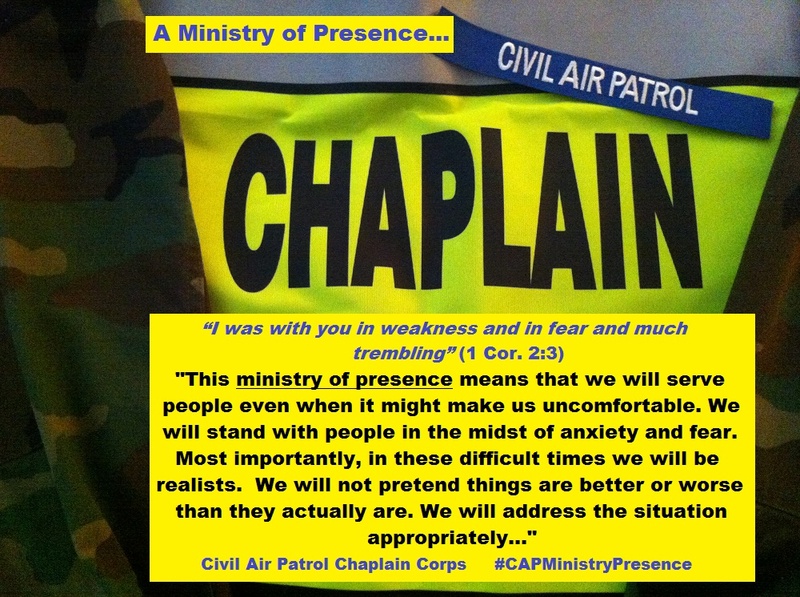 We are YOUR Civil Air Patrol Chaplain Corps and we are here for YOU! d. You don’t have to speak to express love! Chaplains help inspire hope, strengthen spiritual well-being, increase personal resilience, and enhance mission readiness. 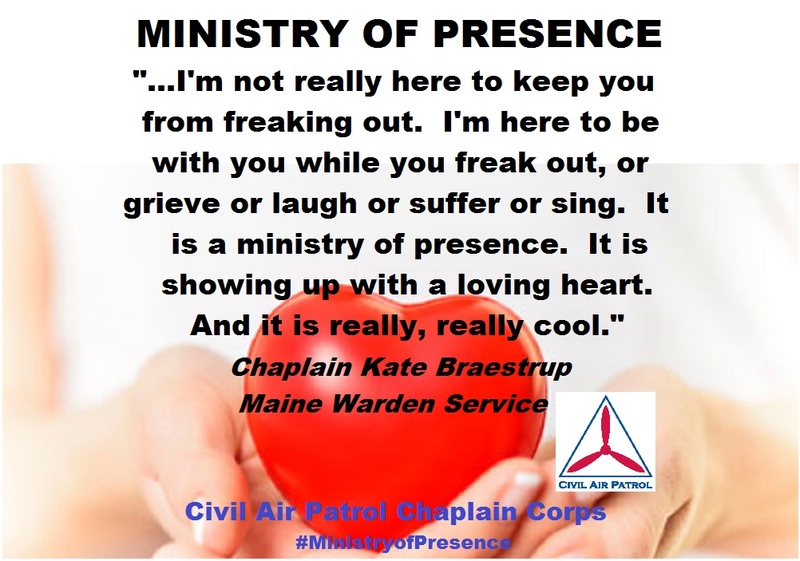 MINISTRY OF PRESENCE: Chaplain Kate Braestrup from the Maine Warden Service, wrote about her chaplaincy experience in a book titled, “Here if you need me.” She said, “Chaplaincy is …work that acknowledges the essentially spiritual nature of the human person and [the] world, but which understands that work in an institutional context and defers to the client as director of his own Journey…” The Civil Air Patrol Chaplain Corps is there for YOU while performing in all our missions as a corporation and the official auxiliary of the United States Air Force. How can we serve YOU? 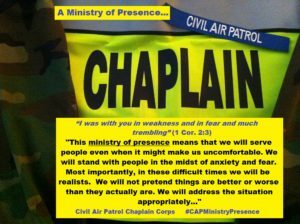 The Civil Air Patrol Chaplain Corps wants to honor and lift up these examples of bravery while in a ministry of presence. Join us for the journey. 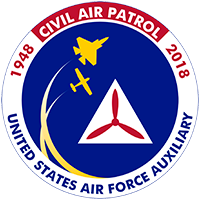 Together, we are the nation’s Civil Air Patrol.